French Sea Salt contains vital mineral blend of potassium, magnesium, calcium and trace elements. Sea salt is highly recommended by health experts to restore, maintain and build optimum health. Gourmet chefs choose sea salt to enhance the flavor of whole foods and it is used in fine cuisines. Health therapists use sea salt to detoxify body, rejuvenate and de-stress the body. Hand-harvested using traditional methods and naturally dried by the sun and wind. No machinery, anti-caking agent and bleaching is used in the processing. Ordinary white and refined salt has 99.9% sodium chloride and no trace minerals. The natural balance of sodium, magnesium and potassium may help to lower blood pressure. Mineral salts help to produce electrolytes and regulate the body’s pH balance. A very effective nasal wash and gargle for colds, allergies or sinus. 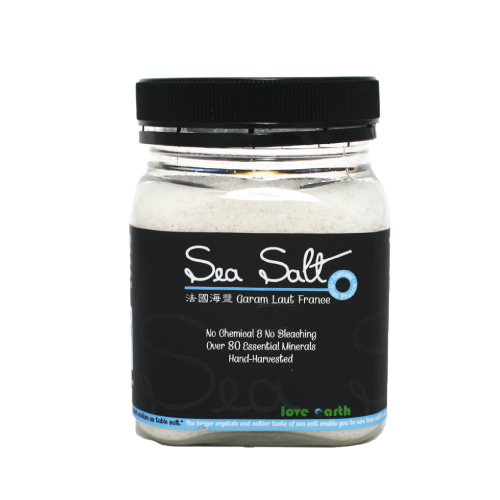 Use for cooking, dipping, scrubbing / sea salt bath (calm psoriasis and skin inflammation). Sprinkle on baked goods for better flavors. Love Earth is a brand established by Wide Tropism, to enable everyone to consume hygiene, with quality and affordable organic products – which could help in maintaining one’s health and also help our one and only mother earth. Love Earth brings everyone only ORGANIC & NATURAL products. Organic is commonly perceived as “expensive” products and is categorized as “high-end” products. BUT!! No more expensive in Love Earth. They provide everyone with the lowest cost they could give and promise to give the best quality they could.